The 150 Davidic Psalms (the Psalter of David) have always been prayed by Old Testament Israel, post-Temple Jews, and by Christians for personal prayer, communal prayer, lamentations, praise, thanksgiving, and, in the case of Christians, to demonstrate the fulfillment of prophecy. They came to form a large part of the Divine Office sung at the various canonical hours by religious. Lay people who didn't have copies of Scripture or the Breviary and lay people and religious who were illiterate would substitute 150 Pater Nosters (Our Fathers) or Aves (Hail Marys) in place of the 150 Psalms they could not read. The prayers were originally counted by transferring pebbles from one bag to another, but soon enough Christians began to tie a rope with knots on which to count. This evolved further into using beads or pieces of wood in place of the knots, and this soon came to be called the "Psalter of the Laity." Around the end of the first millennium, Rosaries contained the present five decades (sets of ten beads), with the Ave beads shaped like white lilies for the purity of the Virgin, and the Pater beads shaped like red roses for the wounds and Passion of Christ. St. Dominic de Guzman popularized the Marian Psalter in the form we have it today (150 Aves with a Pater after each 10) when Our Lady encouraged him to pray it that way in response to the Albigensian heresy. So associated with the Rosary is St. Dominic that the Rosary is often called the "Dominican Rosary." Our Lady also appeared to the children at Fatima and asked that the Rosary be prayed daily, including the "Fatima Prayer," as part of what must be done in order to prevent Russia from spreading its errors throughout the world (the other things being the faithful wearing of the Brown Scapular, the First Five Saturdays Devotion, acts of reparation and sacrifice, and the Consecration of Russia to her Immaculate Heart by the Pope and all the Bishops in union with him. This last has not been done). The Rosary, thus, has always been a weapon against heresy and trouble; in fact, the 7 October 1571 victory of Christendom over Islamic warriors at the Battle of Lepanto -- the first naval victory against the infidels -- was attributed directly to the Rosaries prayed by the faithful. 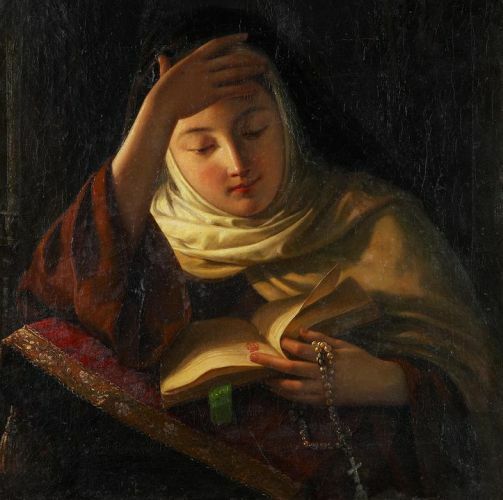 One set of Mysteries is traditionally prayed on different days of the week, and one who prays a single set (i.e., 50 Aves) can be said to have "prayed the Rosary," but, literally, a complete Psalter consists of all 15 Mysteries (150 Aves, going around the beads three times + the 3 Aves that introduce the Rosary). The typical way of Rosary-praying -- i.e., praying a third of a Rosary -- is more accurately, but uncommonly, called praying a "chaplet." (Note that there are many, many different kinds of chaplets -- some to Jesus, some to the Holy Ghost, some to Mary and the other Saints, etc. -- each with different arrangements of prayers and many having their own style of beads). Like the Mass, what you take emotionally from the Rosary is what you bring to it, but in any case, emotional highs aren't the point of prayer. Prayer is for the glory of God. The Rosary beads themselves can be made of gems, stone, wood, crystal, metal -- even bakelite or plastic, and they can be of any color (sometimes the Ave beads will be of one color and the Pater beads of another). Where the two halves of the Rosary come together is a centerpiece, usually a medal with a depiction of the Sacred Heart, Our Lady, and/or a Saint. Most Rosaries are bought pre-made from Catholic gift shops, but there are also many Rosary makers who can put together a customized Rosary for you with your choice of beads and centerpiece. There are also small 1-decade Rosaries that are meant to be highly portable. They're called "Pocket Rosaries" (some are sold to be used in car travel and are sometimes called "Auto Rosaries" or "Car Rosaries"). There are also one-decade Rosaries that are worn on the wrist, and, since at least the 16th century, one-decade "Rosary Rings" worn on the index finger during prayer time (i.e., they're not worn as jewelry). All of these types of Rosaries would be used the same way as ordinary Rosaries, but one would count the same beads 5 times after the introductory prayers. There are also very long 15-decade Rosaries so that one can pray all of the Mysteries, going around the beads only once; these are mostly for the use of religious. Once you purchase or are given a rosary, take it to a priest and have it blessed, thereby turning it into a sacramental. A partial indulgence is gained, under the usual conditions, when praying a third of the Rosary (5 decades) continuously (i.e., one can't say a decade, go wash the dishes, and return to say the other decades). A plenary indulgence is gained, under the usual conditions, when it is prayed by a family group or publicly in a church or oratory. The decades' Mysteries must be announced, and the Mysteries meditated on. Some find that visual aids help them contemplate. Having pictures depicting the Mysteries can help you to stay focused. Sometimes a group of people -- usually a group of families who live in the same area -- get together at regular times to pray the Rosary. They usually meet at a different family's house each time, gather around an image of Our Lady, and pray. These gatherings, known as "Block Rosaries," can be as simple or as ritualized as the organizers like, and can be prayed daily, weekly, monthly, or whenever your group likes. There's a 54-Day Rosary Novena which you can learn about on the Novenas page of this site. On a cultural note, there is a song, written by Robert Cameron Rogers and Ethelbert Nevin, called "The Rosary." It has been recorded many times by many different artists, but most famously by Perry Como. To listen to a very old mp3 of this song and to read the lyrics, visit this page. One final thing before the instructions: a traditional way to keep your Rosary when not in use is to hang it from two pegs such that the middle section swoops down, forming a heart shape reminiscent of Mary's Immaculate Heart. OK, on to how to pray the Rosary! The words of the Rosary's prayers in English and Latin, and relevant Scripture and Readings for each Mystery follow the basic instructions below. The meditations on the Mysteries were written by by Dom Columba Marmion, O.S.B. Abbot of Maredsous, and were given an Imprimatur by John J. Boylan, D.D. Bishop of Rockford in 1949; Scripture is taken from the Douay-Rheims translation of the Bible. First, decide which set of 5 Mysteries you will meditate on (see chart below). Whichever set of Mysteries would feed your soul best or complements the day's liturgy are the ones you should pray, though praying certain Mysteries on certain days of the week or during certain liturgical seasons is traditional and should be followed as much as possible. Because the Rosary is often prayed with certain prayer intentions in mind, many begin by stating their intentions (e.g., "For the conversion of my friend, for the health of my sister," etc.). Have a definite rhythm when praying so you don't lose count. Develop a habit of moving to the next bead only after saying the "Amen" to each prayer. If you'd like to pray along with someone, and see "how it goes," you can listen to and watch the Rosary being prayed in videos here. You will end up back at the first large, red bead with its accompanying prayers. When prayed in a group, the leader (or half of the group) prays the first half of each prayer; the rest of the group prays the second half in response (the breaks in these prayers are indicated by a cross + below). Always end with the Sign of the Cross. Some people dedicate each of the five Paters of the Rosary (the red beads in the diagram) to one of the Five Sacred Wounds of Christ (the wounds in His Hands, Feet, and side), especially when praying the Sorrowful Mysteries. Humility: "we ask for humility of heart"
Charity: "we ask for a perfect love of our neighbour"
Purity: "we ask for the gift of wisdom and purity of heart and body"
Conversions: "we ask you to convert us and all sinners, heretics, schismatics and pagans"
Contrition: "we ask for perfect sorrow for our sins and perfect conformity to your holy will"
Spirit of mortification: "we ask for the grace to mortify our senses"
Detachment from the worldly: "we ask for a deep contempt of the world"
Patience: "we ask for great patience in carrying our cross after you all the days of our life"
death for us and for those who are now in their last agony"
Faith: "we ask for a lively faith"
Hope: "we ask for a firm hope and a great longing for heaven"
and have a happy death"
death and thereafter the eternal crown that is prepared for us"
Some end with the Salve Regina (Hail, Holy Queen), prayers for the Holy Father, the Litany of Loreto (the "Litany of the Blessed Virgin Mary"), and/or the prayer to St. Michael the Archangel. In October: The Prayer to St. Joseph is often added as a concluding prayer, especially during the month of October (this was recommended by Pope Leo XIII). In November and Rosaries for the Dead: The "Eternal Rest" prayer is often prayed in place of the Fatima Prayer during the month of November (especially after dusk on All Saints Day and on All Souls Day) and during Rosaries prayed for the dead, such as at Funeral Vigils. In the name of the Father [touch forehead], and of the Son [touch breast], and of the Holy Ghost [touch left shoulder, then right shoulder]. Amen. In nomine Patris [touch forehead] et Filii [touch breast] et Spiritus Sancti [touch left shoulder, then right shoulder]. Amen. I believe in God, the Father almighty, Creator of Heaven and earth, and in in Jesus Christ, His only Son, our Lord. He was conceived by the Holy Spirit, and born of the Virgin Mary. He suffered under Pontius Pilate, was crucified, died and was buried. He descended into Hell. On the third day He rose again. He ascended into Heaven, and is seated at the right hand of God the Father Almighty. He will come again to judge the living and the dead. + I believe in the Holy Spirit, the Holy Catholic Church, the communion of saints, the forgiveness of sins, the resurrection of the body, and life everlasting. Amen. Credo in Deum Patrem omnipotentem, Creatorem caeli et terrae. Et in Iesum Christum, Filium eius unicum, Dominum nostrum, qui conceptus est de Spiritu Sancto, natus ex Maria Virgine, passus sub Pontio Pilato, crucifixus, mortuus, et sepultus, descendit ad inferos, tertia die resurrexit a mortuis, ascendit ad caelos, sedet ad dexteram Dei Patris omnipotentis, inde venturus est iudicare vivos et mortuos. + Credo in Spiritum Sanctum, sanctam Ecclesiam Catholicam, sanctorum communionem, remissionem peccatorum, carnis resurrectionem, vitam aeternam. Amen. Our Father, Who art in heaven, Hallowed be Thy Name. Thy Kingdom come, Thy Will be done, On earth as it is in Heaven. + Give us this day, our daily bread, And forgive us our trespasses, as we forgive those who trespass against us. And lead us not into temptation, but deliver us from evil. Amen. Pater noster, qui es in caelis, sanctificetur Nomen tuum. Adveniat regnum tuum. Fiat voluntas tua, sicut in caelo et in terra. + Panem nostrum quotidianum da nobis hodie, et dimitte nobis debita nostra sicut et nos dimittimus debitoribus nostris. Et ne nos inducas in tentationem, sed libera nos a malo. Amen. Hail Mary, Full of Grace, The Lord is with thee. Blessed art thou amongst women, and blessed is the fruit of thy womb, Jesus. + Holy Mary, Mother of God, pray for us sinners now, and at the hour of death. Amen. Ave Maria, gratia plena, Dominus tecum. Benedicta tu in mulieribus, et benedictus fructus ventris tui, Iesus. + Sancta Maria, Mater Dei, ora pro nobis peccatoribus, nunc, et in hora mortis nostrae. Amen. Glory be to the Father, and to the Son, and to the Holy Ghost. + As it was in the beginning, is now, and ever shall be, world without end. Amen. Gloria Patri, et Filio, et Spiritui Sancto.+ Sicut erat in principio, et nunc, et semper, et in saecula saeculorum. Amen. O My Jesus, + forgive us our sins, save us from the fires of Hell and lead all souls to Heaven, especially those in most need of Thy mercy. Amen. Oh mi Jesu, dimitte nobis debita nostra, libera nos ab igne inferni, conduc in caelum omnes animas, praesertim illas quae maxime indigent misericordia tua. Amen. See these other pages for other optional concluding prayers and litanies. Picture the scene of the Annunciation. God proposes the mystery of the Incarnation which He will accomplish in the Virgin Mary--but not until she has given her consent. The accomplishment of the mystery is held in suspense awaiting the free acceptance of Mary. At this moment Mary represents all of us in her own person; it is as if God is waiting for the response of the humanity to which He longs to unite Himself. What a solemn moment this is! For upon this moment depends the decision of the most vital mystery of Christianity. See how the Holy Spirit greets the Virgin Mary through the mouth of Elizabeth: "Blessed art thou among women and blessed is the fruit of thy womb! And blessed art thou that hast believed, because those things shall be accomplished that were spoken to thee by the Lord." The Virgin Mary sees in the Infant that she has given to the world, a child in appearance like all other children, the very Son of God. Mary's soul was filled with an immense faith which welled up in her and surpassed the faith of all the just men of the Old Testament; this is why she recognized her God in her own Son. This faith manifests itself externally by an act of adoration. From her very first glance at Jesus, the Virgin prostrated herself interiorly in a spirit of adoration so profound that we can never fathom its depth. In the heart of Mary are joined in perfect harmony a creature's adoration of her God and a Mother's love for her only Son. How inconceivably great the joy in the soul of Jesus must have been as He experienced this boundless love of His Mother! Between these two souls took place ceaseless exchanges of love which brought them into ever closer unity. O wonderful exchange: to Mary Jesus gives the greatest gifts and graces, and to Jesus Mary gives her fullest cooperation: after the union of the Divine Persons in the Blessed Trinity and the hypostatic union of the divine and human natures in the Incarnation, no more glorious or more profound union can be conceived than the union between Jesus and Mary. And it came to pass, that, after three days, they found him in the temple, sitting in the midst of the doctors, hearing them, and asking them questions. And all that heard him were astonished at his wisdom and his answers. "How is it that you sought Me? Did you not know that I must be about My Father's business?" This is the answer that Jesus gave to His Mother when, after three days' search she had the joy of finding Him in the Temple. These are the first words coming from the lips of the Word Incarnate to be recorded in the Gospel. In these words Jesus sums up His whole person, His whole life, His whole mission. They reveal His Divine Sonship; they testify to His supernatural mission. Christ's whole life will only be a clarifying and magnificent exposition of the meaning of these words. St. Luke goes on to tell us that Mary "did not understand the word that He spoke." But even if Mary did not grasp the full significance of these words, she did not doubt that Jesus was the Son of God. This is why she submitted in silence to that Divine Will which had demanded such a sacrifice of her love. "Mary kept these words of Jesus carefully in her heart." She kept them in her heart, for there was the tabernacle in which she adored the mystery concealed in the words of her Son, waiting until the full light of understanding would be granted her. And the whole people answering, said: His blood be upon us and our children. Then he released to them Barabbas, and having scourged Jesus, delivered him unto them to be crucified. Christ substituted Himself voluntarily for us as a sacrificial victim without blemish in order to pay our debt, and, by the expiation and the satisfaction which He made for us, to restore the Divine life to us. This was the mission which Christ came to fulfill, the course which He had to run. "God has placed upon Him"--a man like unto ourselves, of the race of Adam, but entirely just and innocent and without sin--"the iniquity of us all." Since Christ has become, so to speak, a sharer in our nature and taken upon Himself the debt of our sin, He has merited for us a share in His justice and holiness. In the forceful words of St. Paul, God, "by sending His Son in the likeness of sinful flesh as a sin-offering, has condemned sin in the flesh." And with an impact still more stunning, the Apostle writes: "For our sakes He (God) made Him (Christ) to be sin who knew nothing of sin." How startling this expression is: "made Him to be sin"! The Apostle does not say "sinner," but--what is still more striking--"sin"! Let us never forget that "we have been redeemed at great price by the precious blood of Christ as of a lamb without blemish and without spot." And stripping him, they put a scarlet cloak about him. And platting a crown of thorns, they put it upon his head, and a reed in his right hand. And bowing the knee before him, they mocked him, saying: Hail, king of the Jews. The cowardly Roman governor imagines that the hatred of the Jews will be satisfied by the sight of Christ in this pitiful state. He shows Him to the crowd: "Ecce Homo--Behold the Man!" Let us contemplate our Divine Master at this moment, plunged into the abyss of suffering and ignominy, and let us realize that the Father also presents Him to us and says to us: "Behold My Son, the splendor of My glory--but bruised for the sins of My people." And from henceforth Pilate sought to release him. But the Jews cried out, saying: If thou release this man, thou art not Caesar's friend. For whosoever maketh himself a king, speaketh against Caesar. Now when Pilate had heard these words, he brought Jesus forth, and sat down in the judgment seat, in the place that is called Lithostrotos, and in Hebrew Gabbatha. And it was the parasceve of the pasch, about the sixth hour, and he saith to the Jews: Behold your king. But they cried out: Away with him; away with him; crucify him. Pilate saith to them: Shall I crucify your king? The chief priests answered: We have no king but Caesar. Then therefore he delivered him to them to be crucified. And they took Jesus, and led him forth. And bearing his own cross, he went forth to that place which is called Calvary, but in Hebrew Golgotha. Where they crucified him, and with him two others, one on each side, and Jesus in the midst. In this Simon represents all of us. As members of the Mystical Body of Christ, we should all help Jesus to carry His Cross. This is the one sure sign that we belong to Christ--if we carry our cross with Him. And the sun was darkened, and the veil of the temple was rent in the midst. And Jesus crying out with a loud voice, said: Father, into thy hands I commend my spirit. And saying this, he gave up the ghost. At the Last Supper, when the hour had come to complete His oblation of self, what did Christ say to His Apostles who were gathered around Him? "Greater love than this no man hath, that a man lay down his life for his friends." And this is the love, surpassing all loves, which Jesus shows us; for, as St. Paul says, "It is for us all that He is delivered up." What greater proof of love could He have given us? None. Hence the Apostle declares without ceasing that "because He loved us, Christ delivered Himself up for us," and "because of the love He bears for me, He gave Himself up for me." "Delivered," "given"--to what extent? Even to the death on the cross! What enhances this love immeasurably is the sovereign liberty with which Christ delivered Himself up: "He offered Himself because He willed it." These words tell us how spontaneously Jesus accepted His Passion. This freedom with which Jesus delivered Himself up to death for us is one of the aspects of His sacrifice which touch our human hearts most profoundly. And the angel answering, said to the women: Fear not you; for I know that you seek Jesus who was crucified. He is not here, for he is risen, as he said. Come, and see the place where the Lord was laid. On the day of His Resurrection Jesus Christ left in the tomb the shroud which is the symbol of our infirmities, our weaknesses, our imperfections. Christ comes from the tomb triumphant--completely free of earthly limitation; He is animated with a life that is intense and perfect, and which vibrates in every fibre of His being. In Him everything that is mortal has been absorbed by His glorified life. Here is the first element of the sanctity represented in the risen Christ: the elimination of everything that is corruptible, everything that is earthly and created; freedom from all defects, all infirmities, all capacity for suffering. But there is also another element of sanctity: union with God, self- oblation and consecration to God. Only in heaven shall we be able to understand how completely Jesus lived for His Father during these blessed days. The life of the risen Christ became an infinite source of glory for His Father. Not a single effect of His sufferings was left in Him, for now everything in Him shone with brilliance and beauty and possessed strength and life; every atom of His being sang an unceasing canticle of praise. His holy humanity offered itself in a new manner to the glory of the Father. By faith Henoch was translated, that he should not see death; and he was not found, because God had translated him: for before his translation he had testimony that he pleased God. If Christ Jesus wishes us to love all the members of His Mystical Body, should we not love above all others her who gave Him the very nature by which He became our Head, the same nature which He uses to communicate His grace to us? We cannot doubt but that the love which we show to his Mother is extremely pleasing to Christ. We shall manifest our love by extolling the sublime privileges which Jesus has bestowed on His Mother, among which the Assumption is one of the most glorious. If we wish to please our Lord very much, we shall admire the wonderful gifts with which He has lovingly adorned the soul of His Mother. He wishes that we should sing the praises of the Virgin, who was chosen among all women to give the Savior to the world. "Yes, we shall sing your praises, for you alone have delighted the heart of your God. May you be blessed, for you have believed the word of God, and in you the eternal promises have been fulfilled." This novelty does not change the Rosary itself and is merely presented as an option for Christians. This option, however, is one that totally disrupts the relationship between the Rosary and the Breviary's Psalms. Traditional Catholics stick with the classic tried-and-true Rosary, at least for public Rosaries. To read why, see this page.